Jennifer Lawrence in Dior. I was really happy for her to win Best Actress. I saw Silver Linings Playbook on my birthday and absolutely loved her performance. I thought she looked like a princess in this gown. The color and train were exquisite. The backwards necklace made this look all the more memorable. Amy Adams in Oscar de la Renta. I normally don't like the way pastels look against fair skin (from my own personal experience) but for whatever reason, this color looked gorgeous. There aren't many times a woman can wear a ball gown but the Oscars is definitely the right place to do it. I love everything from the fabric to the cut. I also think the loose hair makes it less formal and modern. Perfection. Zoe Saldana in Alexis Mabille. I think she always knocks it out of the park on the red carpet. She's stunningly beautiful and has the type of body that makes anything look amazing. I wasn't in love with the grey and black layered fabric on the train of this dress but it was enough to make it interesting. The cut of the top is to die for. Naomi Watts in Armani Prive. Initially, I wasn't overly blown away by this look but the gown quickly grew on me. I think it was the hair that threw me off. The cut, material and fabric of the dress are well ahead of its time. It's very difficult to pull something like this off but it worked. Love the makeup. 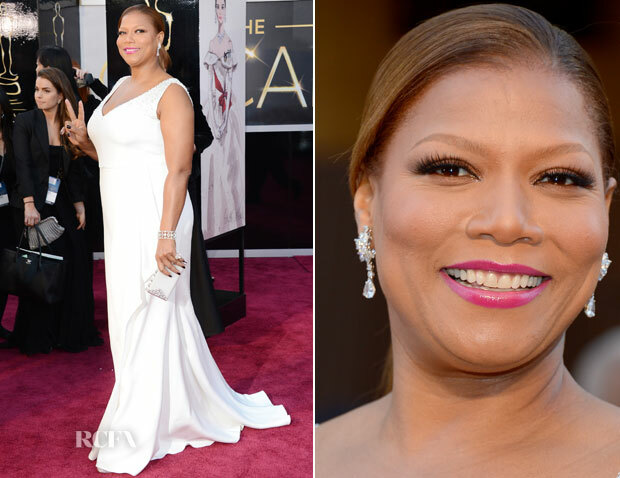 Queen Latifah in Badgley Mischka. I thought she looked elegant in this dress. Her skin and makeup were also on point. The simplicity of the dress and the stark white color worked very well on her. Nicole Kidman in L'Wren Scott. She has been killing it on the red carpet lately. This is a fantastic dress and she looks wonderful in it. For whatever reason, I wouldn't have expected this type of fit or material from her at the Oscars but it works. I love to hear her speak. Charlize Theron in Dior. While many will say this is far too reminiscent of Anne Hathaway's Chanel look at the Golden Globes, I see enough of a difference. It takes a truly beautiful woman to pull off a hair cut like this and still look ultra-feminine. The skin. The face. The height. Everything. Stacy Keibler in Naeem Khan. I almost missed this one in its entirety. I didn't watch much of the red carpet interviews and I was listening to the actual show more than watching. I caught this look by accident on the web. I don't think it's the best she's ever looked but I love the back of the dress and the fact that the beading is different. Jessica Chastain in Armani Prive. As a redhead, I'm partial to wearing anything in the gold or bronze family. When you have coloring like Jessica, this is the way to go. I'm not in love with the fit or even the cut but the color and detailing alone are enough. The hair and makeup are also great. Reese Witherspoon had an excellent hair day and the color of her dress was dynamite. Screenwriters deserve more credit. Where would we be without the script? I wish people prepared speeches and didn't mention a gaggle of random names. I didn't even notice that George Clooney was actually there. Bradley Cooper still makes my heart race. Jane Fonda is the coolest. I fell asleep and had to rewind the last hour of the show.